On Saturday, children with Big Brothers Big Sisters were able to let their imaginations run wild, creating animations and games with laughing wizards, hungry sharks and mystical creatures riding on magic carpets. 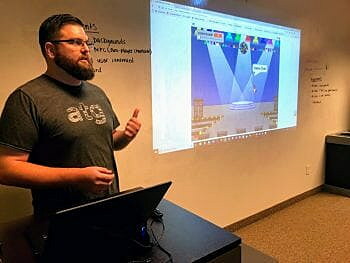 During a summer camp activity hosted by Missoula’s Advanced Technology Group and Big Brothers Big Sisters, kids learned about the basics of programming using a software called Scratch, which allows users to program characters, or sprites, to interact with their surroundings, objects or other sprites. The visual language can be connected in blocks, telling characters or objects to move, make sound, display text in a speech bubble, and change costumes and backdrops. The program allows a user to be as creative as they want, with categories of characters, sounds and motions. Animations can be turned into mini-games with controllable sprites and scoreboards. Each pair of kids created their own animations after a few ATG employees showcased their creations and demonstrated how the software worked. Big Brother Big Sister participant Nicole said that she’s never tried animation or programming before, but found it to be an enjoyable experience as she created a mini-game with her partner, Anthony. The animation involved two sharks, one shark being a non-player character that is programmed to move on its own, while the other shark is controlled by the user. To win the mini-game, the user must direct the shark to the fish in the middle of the screen five times before the other shark reaches the fish. The program has been used not only by kids, but also by college students in a programming introductory course at Harvard and other universities. With a focus on tech industry development in Montana, exposure to programs like this is important, said ATG’s Kayleigh Blair, a member of the company’s philanthropy committee. The program is very user friendly, allowing kids to learn about technology in a fun and interactive way. Big Brothers Big Sisters works with other nonprofits or private companies to host activities like cooking classes and outdoor recreation. 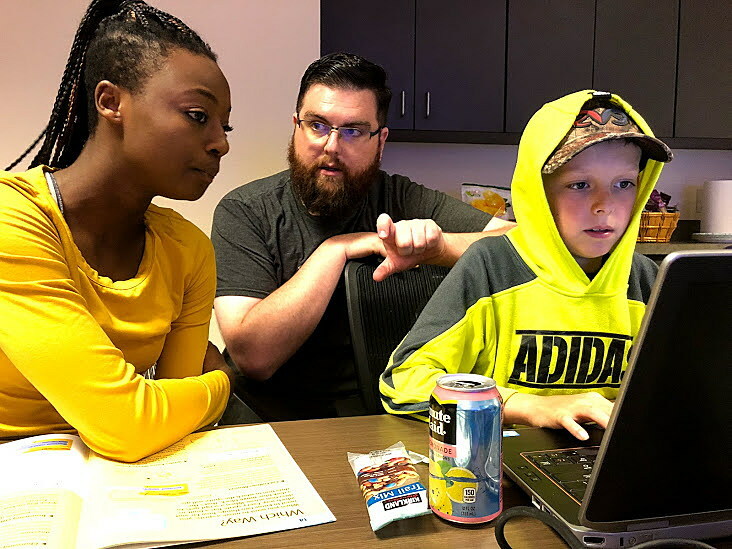 Maria Newbold, a match support specialist with Big Brothers Big Sisters, said that collaborating with ATG was the first time the organization has helped host a group activity in programming and animation. Along with its first summer camp, ATG is involved in community stewardship and other programs that teach kids about technology. Employees participate in the University of Montana Science Opportunities for Kids program, or SOKS, an afterschool program for fourth- and fifth-graders at Bonner, Franklin and Lolo elementary schools where kids take apart laptops and learn about prosthetics. Employees also help clean up the Clark Fork River and implement software for the Missoula Food Bank Network. ATG’s philanthropy committee plans on collaborating with other organizations to host more group activities that involve technology education during the upcoming school year.